No kit is complete without a pair of socks, and standing out on the pitch for the new season is the Liverpool FC 16/17 3rd Football Socks, designed by New Balance.Made from nylon and elastane, these official Liverpool socks from their 3rd kit for the 2016/2017 Premiership season come in a bright Toxic Yellow, making them perfect for play in low visibility conditions. With the club badge proudly displayed on them, they also provide comfort and support for casual or competitive play. 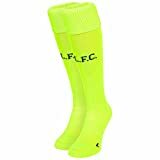 Prove you’re a diehard supporter of LFC by pulling up a pair of these Liverpool FC 16/17 3rd Football Socks. Complete your kit with a Liverpool FC 16/17 3rd S/S Football Shirt and Liverpool FC 16/17 3rd Football Shorts. This entry was posted in Liverpool and tagged 16/17, Football, Liverpool, Size, Socks by Footy Star. Bookmark the permalink.